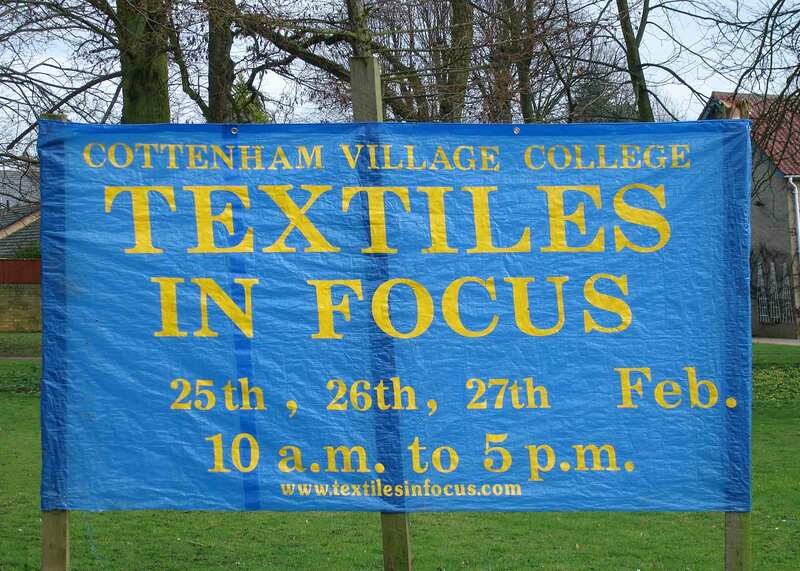 "Textiles in Focus" is a textile exhibition and trade show, spanning 3 days at the Cottenham Village College, Cottenham, Cambridge. It comprises a combination of suppliers and traders selling art, textile and artists materials, craft, knitting and stitching wares of all shapes and sizes. Dawn Thorn will be the guest speaker for a lecture on "Transparency and Dimension" at 2 p.m. on Saturday 26th February at 2 p.m. Following the success of its 2010 exhibition "Bloomin' Marvellous", OTT was invited to exhibit as a group at the above event. One of two invited groups (the other is "Fibrefusion"), the group exhibited its work in a dedicated space in one of the studios at the College. This work comprises both art work and 3D items. As well as exhibition pieces on sale, there will also be portfolio pieces, cards, inspiration packs, and other items. "Textiles in Focus" ran from the 25th to the 27th February 2011. Entrance times were 10am – 5pm (Friday & Saturday) and 10am – 4.30pm (Sunday). Please click on the image below to see images from the Exhibition.